The medieval forerunner of Tic-Tac-Toe, or naughts and crosses, three man's morris (or mills) is tantalizingly strategic. 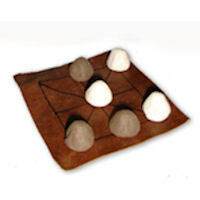 The game is supplied with the rules of play, a leather board, and ceramic, fired game pieces. Comes packed in a short cardboard tube for easy transport and storage.